When he bought into the Humber Valley Resort dream back in 2003, Simon Burch never envisioned he would be organizing contracts to provide essential services to the site nearly six years later. Despite some nightmarish developments in the last year or so, the dream is still alive for Burch and the other chalet owners at the resort who are doing their part to shake the facility out of the doldrums. In the past few days, service contracts to provide snow clearing and garbage collection at the resort have been confirmed. A flyer, similar to the trucks used to clear the province’s highways, and a front-end loader will handle snow clearing, sanding and ice removal. Dumpsters will be place on-site for resort owners and users to deposit garbage for regular collection. Security at the resort, which went into bankruptcy Dec. 5, is in place 24 hours a day, seven days a week. The provision of water and street lighting is being handled by Ernst and Young, the trustee in bankruptcy. In addition to those essential services being made available, a number of companies are working on behalf of chalet owners to market properties available for rent. Some chalet owners have opted to take it upon themselves to market their chalets on their own. With all that in place, Burch — a member of the committee representing 300 chalet owners — said the resort is once again a going concern. “All the essential services for people wanting to come stay on the resort are now available,” said Burch as he drove past a snowplow clearing one of the resort’s thoroughfares. “People can safely book a holiday here now, secure in the knowledge they will be able to get in and out of their chalets and arrangements are in place for rubbish and water. That’s a big step forward from this past fall when Newfound NV, the owners and majority shareholders in the Humber Valley Resort Corporation, shut the operation down as it filed for creditor protection and tried to restructure the resort’s business plan. Those efforts failed and the corporation went bankrupt earlier this month. The key attractions of the Humber Valley, said Burch, still are the scenery and the local people. The recent history of the resort generated a lot of bad publicity for it and the Humber Valley region in general, not to mention create bad blood between those who have invested in chalets and the resort management. Burch will be marketing his own chalet and three others, but didn’t want to do so until essential services were in place. Burch, who will concentrate on marketing to the St. John’s area, expects new marketing efforts from all the owners will ramp up soon. “This resort still has a very good future,” said Burch. “All the key building blocks that encouraged us to buy here are still here. What we have is a company that did a terrific job of realizing a vision and building a resort, but a lousy job of running it, that has now gone bust. 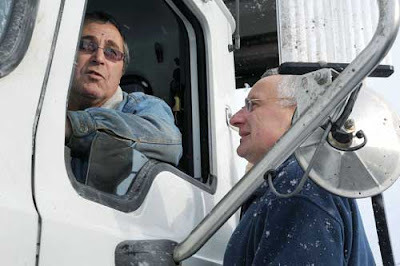 Don Cross drives one of the machines owned by NCL Holdings, the Deer Lake company hired to do the snow-clearing duties. He too is confident the resort will bounce back. “It’s good to see people coming back here who are going to spend time on the west coast,” he said. “The economics of it all still makes good sense for this area. While the resort owners feel they have gotten over an important hurdle towards recovery, Burch said they only have a short while to catch their breath before going abut the task of revising how the resort will operate into the future. The next major step will come Jan. 7 when Ernst and Young will meet with Humber Valley Resort’s hundreds of creditors, including chalet owners and Newfound NV — the latter which invested more than $44 million into the resort. According to documents obtained by Transcontinental Media, some 279 creditors are owed more than $100 million. There has been some talk that Newfound NV could be in a position to actually buy the back the resort as part of the bankruptcy process. Burch said Newfound NV is not wanted back. “That would be a travesty,” said Burch. “They have walked away from their commitments to the owners, from their debts to the local businesses and from community and they haven’t demonstrated any commitment to the resort, to the island or to making a success of this place. Burch said repairing the resort’s damaged reputation will be the goal of the owners, though he has no idea how that will be done or how long it will take. Humber Valley Resort Corp. on Newfoundland's west coast will begin selling off its assets to pay creditors after falling into bankruptcy, its parent company said this week. The failed high-end resort near Pasadena had been publicly struggling for months with its finances, after laying off 40 workers in August, but its parent company, British-based Newfound NV, said the resort's troubles began the day it opened. "Newfound is the biggest fiscal creditor of Humber Valley resort corporation," said Newfound NV CEO Jayne McGivern. "We are owed over $46 million because Newfound has been propping up the resort since it began. Newfound has never made a dollar's profit out of Humber Valley Resort Corporation." The destination resort and golf course sold luxury chalets to foreign customers, offering charter flights from Europe to nearby Deer Lake airport. McGivern told CBC News the resort lost close to $1 million a year on just the flights alone. She said by the time Newfound NV took over the resort, it was too late. "We arrived here in July and we came to the conclusion by September that A, Humber Valley resort corporation was not viable and B, was unlikely to return the monies we've invested in it." The company had filed for bankruptcy protection in September in efforts to save the resort. However, last week Newfound NV sent a letter, signed by McGivern, to chalet owners advising them that the company would not reapply for bankruptcy protection. The company had been attempting to restructure itself through Newfoundland Supreme Court-granted protection. In the letter, McGivern said the company can no longer wait for answers from the Newfoundland and Labrador government for assistance on issues such as arranging flights from the United Kingdom to help the company's European clientele. McGivern told chalet owners that, after weeks of talks with government, she informed officials on Nov. 24 that last Friday was "our absolute deadline" for a reply. "This was, sadly, not forthcoming," she wrote. Not only did the overseas flights send the resort into the red, the clubhouse, golf course and restaurant never made any money either, according to McGivern. The resort owes thousands to contractors and building supply companies, on top of the $46 million it owes Newfound NV. One of the world’s premiere travel magazines has featured Newfoundland and Labrador in a special anniversary edition. Wanderlust, a leading United Kingdom travel magazine, issued a “100 Greatest Travel Secrets” for its 100th issue and 15th anniversary celebration. 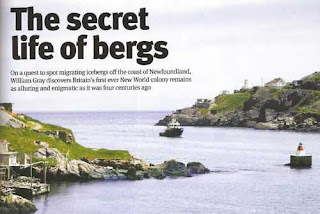 While Sarah Baxter, the magazine’s deputy editor, said the 100 secrets were not ranked, Newfoundland and Labrador certainly deserves being one of the “larger secrets” as the first destination revealed in the issue. It was geography and attractiveness that led to the province being featured, says the editor. She also feels Newfoundland has the authenticity the magazine’s readers crave. Gray, an award-winning travel writer and photographer, told The Star he came to Newfoundland to see icebergs. The first-time visitor to the island travelled from Deer Lake through to Gros Morne and up the Northern Peninsula to Quirpon, and back. While it was after the iceberg season and he returned without capturing a single sighting, he was not disheartened. The absence of icebergs was overshadowed by the scenic beauty of the coastline and the abundance of marine and wildlife and food and hospitality. Gray said he wants to return, noting a family vacation would be ideal, and get a glimpse of the elusive icebergs. He would like to explore the east coast too. Meanwhile, Maria Matthews, chair of Western Destination Marketing Organization and owner of Vision Atlantic, was thrilled with the feature. She said it was long overdue. “It just proves what we have known all along, that this destination has the potential to compete with the very best, and how ironic that we are going through this flight nightmare?” she said, referring to the efforts to secure an international flight to the area. Mike Ward, chair of the Humber Valley Resort owners committee, said the recognition portrays the opportunity that exists for Newfoundland as a tourist destination. “People are clearly looking for a different experience than a typical beach holiday and it is great that the magazine has recognized the potential that exists,” he said. Ward also raised the question of accessibility to the island and the expense of excessive air travel that results from the loss of a direct flight from Gatwick to Deer Lake. 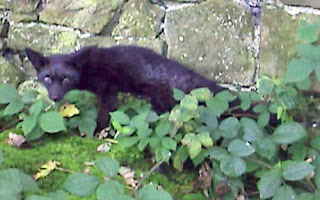 Ward has visited the west coast at least twice a year for the last five years, and is hoping for some resolve in travel challenges. “Gros Morne is a truly special place and tourists love to go whale watching and see the icebergs, and this is very different to holidays in Europe,” he said. “The skiing at Marble Mountain has powder which is better than anywhere in Europe and you get significantly more skiing because of the lack of lineups. What if Newfound NV want HVR back? Hopefully new owners and operators of the resort will be found quickly, and that will work properly with the chalet owners, the local communities/businesses, and the provincial government. But what if Newfound NV want HVR back? It's not impossible! Has the whole process been staged to clear the creditors and "start again"? Lets hope not, as all involved need the main operators of the resort to be passionate about Western Newfoundland and the Humber Valley, not just their shareholders. Above all, if the goal is not to attract tourists and guests to the area - it's not going to work. We've suffered four years of inbalance between schmoozing potential investors, and attracting real holiday makers, resulting in actually the main visitors being the owners and their friends and family. So how would everyone react if Newfound NV (or one of its partner entities) tries to buy back the resort out of bankruptcy? What do you think? If you've got a view, hit the comments link below!!! CORNER BROOK — Justice Minister Tom Marshall has taken issue with the parent company of Humber Valley Resort’s stance that it was the government’s “preference” for the operation to go bankrupt. The Tory legislature member for Humber East, whose duties include monitoring developments at the beleaguered resort situated in his district, said government was not about to use the province’s resources to bail out the private business. The Humber Valley Resort Corporation (HVRC), a subsidiary of parent company Newfound NV, terminated its protection from creditors one week ago today. That same day, the resort filed an assignment in bankruptcy. This past Monday, chalet owners and other creditors were sent a letter from Stephen Bentley, Newfound’s group finance director, notifying them that bankruptcy has been filed for, and that Newfound, which had sunk about $46 million into the resort, is also now a creditor. In the correspondence, Bentley reiterated Newfound’s stance that bankruptcy was not the resort corporation’s intention and its chances of avoiding such measures depended on support from the provincial government. The resort wanted government to help maintain direct flights to the United Kingdom, help a local, incorporated municipality to administer basic services such as snowclearing and garbage collection, and free up land the resort had been leasing until recently. “Whilst initial discussions appeared to be fruitful, in recent weeks it has become clear through media reports and correspondence with the company that the government of Newfoundland would prefer that the resort goes into bankruptcy before they make a decision on their future involvement with HVRC,” wrote Bentley. Marshall said the province still has not ruled out enhancing marketing effort towards helping fill charter flights, and the Department of Municipal Affairs will work with any municipality considering expanding its services to the resort, but was not going to invest any money directly in the resort. When it came to the Crown land issue, though, he said there was no way the government was going to give that up without getting fair market value in return. The minister said his 32 years of practising law has shown him that it is typical for businesses that go bankrupt to shift blame for the downfall. Now that bankruptcy has been filed for, the assets of the resort — including all real property, buildings, equipment and accounts receivable — have been assigned to the firm Ernst and Young, which was the court-appointed monitor of the resort’s activities during the creditor protection phase of its attempt to restructure. “We are the trustee in bankruptcy until the first meeting of creditors, at which time the creditors will confirm us as trustee or substitute another in our place,” Mathew Harris, managing partner of Ernst and Young’s Atlantic Canada Office, told The Western Star via e-mail correspondence. Harris could not speculate on how long the process of liquidating assets would take. The money generated from selling off resort assets would eventually be distributed among creditors in accordance with a scheme of priority set out in the federal Bankruptcy and Insolvency Act. Harris said there are several hundred creditors involved, representing indebtedness totalling roughly $65 million. While Newfound NV is one of those creditors, it does not hold any special status. It is possible Newfound NV could eventually buy the property back. Harris said the bankruptcy process would not give Newfound NV any particular advantage over any other entity interested in taking over the facility. And some strong comments already appearing on the Western Star site - including "Go away Newfound NV ..."
The formal press release from Newfound NV today, was the final goodbye from Humber Valley Resort's (ex-)parent company. Now it's down to the court and it's nominated representatives. Newfound N.V. (AIM: NFND) announces that its subsidiary, Humber Valley Resort Corporation ("HVRC"), has filed for bankruptcy following the expiry of proceedings under the Canadian Companies Creditors Arrangement Act ("CCAA") initiated in September2008. This action does not impact either the financial situation of Newfound NV or the projects at St. Kitts and Nevis, which remain unaffected. Stephen Bentley, Group Finance Director of Newfound, said: "It was not our original intention that HVRC should make an application for bankruptcy. Indeed we had formulated a draft preliminary plan of arrangement that, in our view, gave the interested parties the best result given the unhappy circumstancesthat Humber Valley Resort Corporation found itself in. However, our plans required and depended on support from the Government of Newfoundland. Their support was needed specifically with regard to flights to Newfoundland from the UK; support for the municipality that would administer basic services to the resort; and finally, a grant of freehold by the government over the portions of long leasehold land already paid for by HVRC. Whilst initial discussions appeared to be fruitful, in recent weeks it has become clear through media reports and correspondencewith the company, that the Government of Newfoundland would prefer that the resort goes into bankruptcy before they make a decision on their future involvement with HVRC. In these circumstances, and with Newfound continuing to finance the CCAA process each month, the Board feels it is not appropriate for Newfound to carry on spending significant sums of money where there appears to be little or no prospect of bringingthe process to a firm resolution. We therefore have no alternative but to allow the CCAA process to lapse and for HVRC to file for bankruptcy. I deeply regret that this has come to pass and that Newfound, as the largest fiscal creditor, now joins thewider list of creditors awaiting the outcome of the bankruptcy process." With sadness I have to blog that today Humber Valley Resort Corporation (HVRC) announced that it is to file for bankruptcy. See below for their announcement email. We can only hope that when everyone including creditors, owners and the local community (& its economy) have got through the next stages of the ongoing process ... what's left of the resort and everyone directly and indirectly involved with it, can grow into that vision and belief that we all had, and mostly still have. We all share the passion of, & belief in, Western Newfoundland & its people. In fact We're Crazy About Newfoundland.com ... Are you? You may recall from our presentation and earlier correspondence that, during the time Newfound has been financing the CCAA process, we also formulated a draft preliminary plan of arrangement that, in our view, gave the interested parties i.e. the creditors and the chalet owners the best result in the unhappy circumstances that Humber Valley Resort Corporation found itself in. * Transferring into freehold, the amount of leasehold land that HVRC had already paid leasehold fees on, so that financing of new development could take place enabling the creditors to participate in the resultant profits. It was not feasible to submit our proposed plan to the Court for approval, or to the creditors and chalet owners to vote on, unless we had some indication of support from the Government, in writing, to it. Conditional support would have been acceptable. The Government have had our proposal for consideration since 16 October. Whilst it is fair to say that we have had encouraging discussions, we have had no confirmation of the Government position, either verbally or in writing. Our initial requested deadline for a decision was 14 November. I was promised on Monday 24 November that, after the Cabinet meeting of 27 November I would be informed of the decision, either way, in writing. I explained during that conversation that we had run out of time as our CCAA protection was due to expire and if I could not submit the plan then I would have no choice other than to withdraw our proposal, which would mean imminent bankruptcy for HVRC. The alternative would be for Newfound to risk a great deal more money as a creditor to HVRC and I do not have Board authority to do so. I was very careful to stress to the Government on Monday 24 November, that I wanted to and was able to continue, but was clear that close of business on Friday 28 November was our absolute deadline for a Government reply. This was, sadly, not forthcoming. I understand, from a third party, that the proposition was discussed as cabinet but there was no resolution. Despite our best efforts, there is nothing further we can do. I am deeply disappointed, as I still believe our ideas were the best possible result in the circumstances. In these circumstances, I am afraid that we join you all as another creditor, and confirm that HVRC will have to file an Assignment in Bankruptcy, and that bankruptcy is now imminent. I am so sorry not to bring you better news. Should you have any questions, you may, with immediate effect, address them to Mat Harris and his team at Ernst and Young. Derrick White will no longer be in a position to formally help you. Monday 1st 5pm ... that's the deadline for creditors! Owners, construction companies, suppliers and others are all busy completing their CCAA claim forms. What next? Time will tell - perhaps before the next court deadline of Fri 5th Dec.